b. The western boundary of EAME Theater is from the North Pole, south along the 75th meridian west longitude to the 77th parallel north latitude, then southeast through Davis Strait to the intersection of the 40th parallel north latitude and the 35th meridian west longitude, then south along the meridian to the 10th parallel north latitude, then southeast to the intersection of the Equator and the 20th meridian west longitude, then along the 20th meridian west longitude to the South Pole. The eastern boundary of the EAME Theater is from the North Pole south along the 60th meridian east longitude to its intersection with the east boundary of Iran, then south along the Iran boundary to the Gulf of Oman and the intersection of the 60th meridian east longitude, then south along the 60th meridian east longitude to the South Pole. The EAME Theater included Europe, European Russia, Greenland, Iceland, Africa, Iran, Iraq, and Turkey. 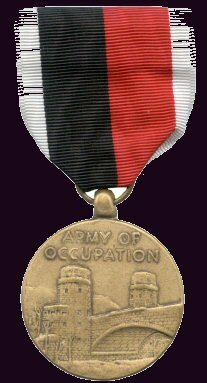 The WW II Victory Medal was awarded to all military personnel for service between 7 December 1941 and 31 December 1946. 4. Currently serving under honorable conditions or honorably discharged from active duty. As prescribed by New York State Military Law, were a prisoner of war, served at Pearl Harbor on December 7, 1941, directly participated in the D-Day Invasion of Normandy on June 6, 1944, or have been declared by the Department of Defense as killed or missing in action.